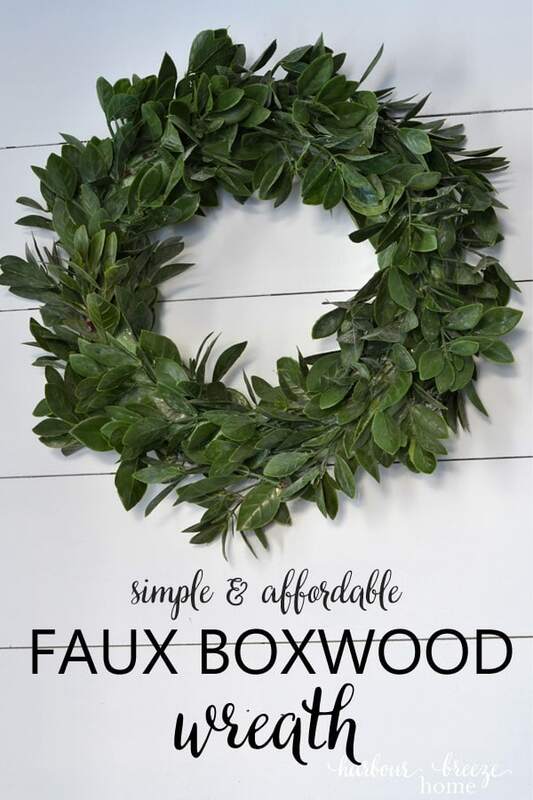 I’ve long admired boxwood wreaths in home decor, and have been on the lookout for them for quite some time. I specifically wanted 2 small faux boxwood wreaths for the doors of my entryway closet. As I’ve been searching for half of forever, it seems, I’ve discovered 2 things. I couldn’t find any of the small variety at all! 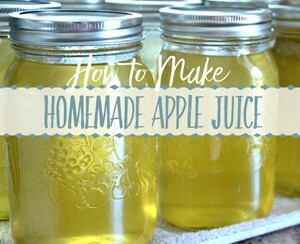 My search eventually led to a “make it yourself” situation. It ended up being such a quick and fun little project. Step 1: Prepare the faux boxwood leaves by washing them and cutting them into small, individual branches. After searching high and low for affordable faux boxwood greenery, I finally found it on a large ready-made wreath on a huge after Christmas clearance sale! (It was only $6!.) To use it for my purposes, I ripped out each bundle of boxwood and rinsed it off in a sink full of water with a little dish soap and vinegar. Then, using wire cutters, I snipped apart each boxwood branch into individual pieces. I found I could hand place them better individually than trying to tame a larger floral pick. 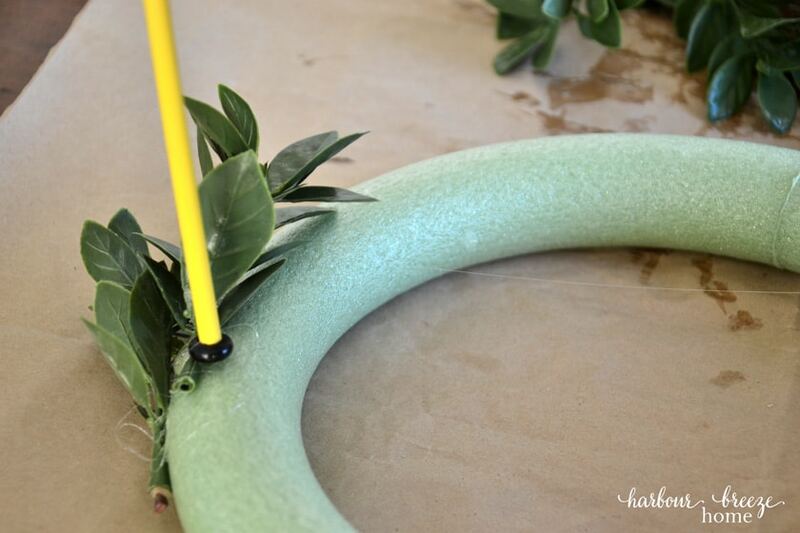 Step 2: Glue the boxwood leaves onto the foam wreath form so that all the leaves are pointing in the same direction. 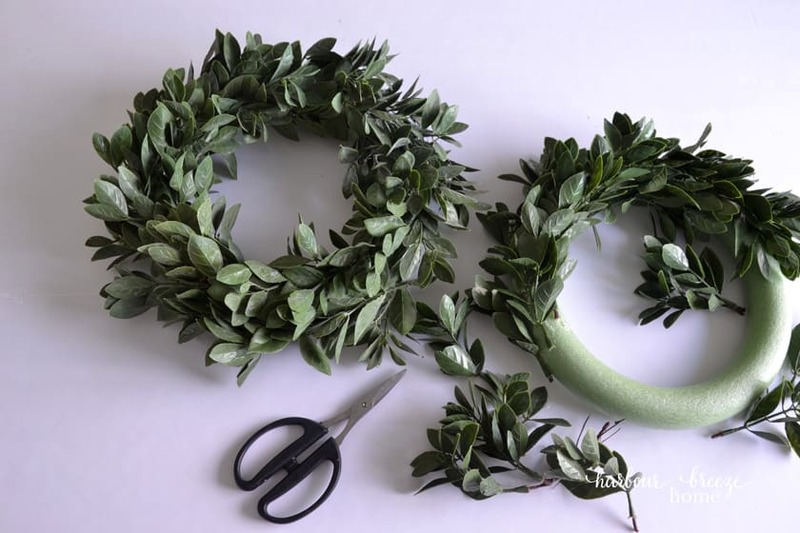 Many boxwood wreaths are done using grapevine wreath forms, which are really pretty, too. However, I couldn’t easily find them in my town, so foam forms at the Dollar Tree were my answer. I was worried that the glue would melt the foam a bit. However, it didn’t. Step 3: Keep gluing all the way around until the front and sides of the wreath form are completely covered. I found it helpful to hold the wreath up from time to time to make sure the leaves were symmetrical around the form. If it looked sparse in one area, I would just add more glue and greenery. Keep filling it until it is the desired full look you’d like. Step 5: Hang them up! Once the wreaths are completed, the final step is just to hang them up and enjoy! Since these were made out of foam, I simply hammered a nail into the closet door and pressed the wreath into it at the desired height. The nail punctures the foam and holds tightly to it. Easy peasy! These wreaths would also work well for a front door. A big burlap or linen ribbon could loop over it and be hung from a hook. It would look great! 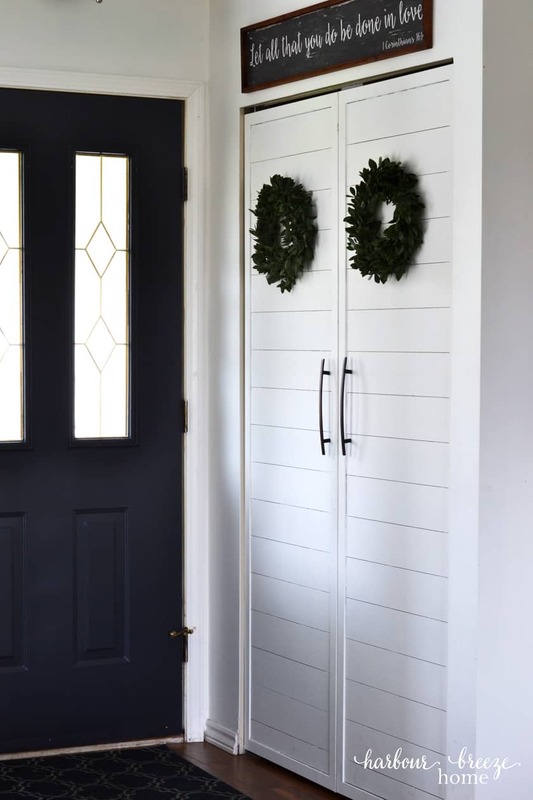 LOVE the wreathes and LOVE those doors!!! Drool worthy picture!!! 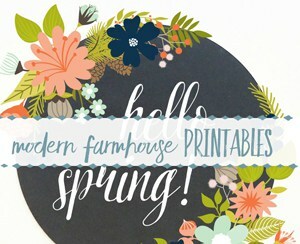 Super cute, and easy… and affordable. Thanks for sharing these mini boxwood wreaths, Rita! Pinned! I love these Rita! Boxwood wreaths are crazy expensive. 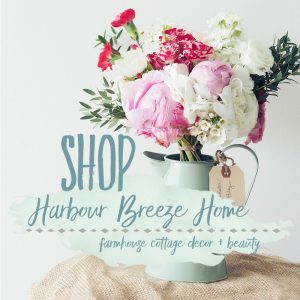 You did a great job making a budget friendly version, and they look fabulous on your closet doors! Those wreaths turned out beautifully…and yes, I will have to try the knitting needle tactic! I have burned my fingers with hot glue more than I could ever tally or count! 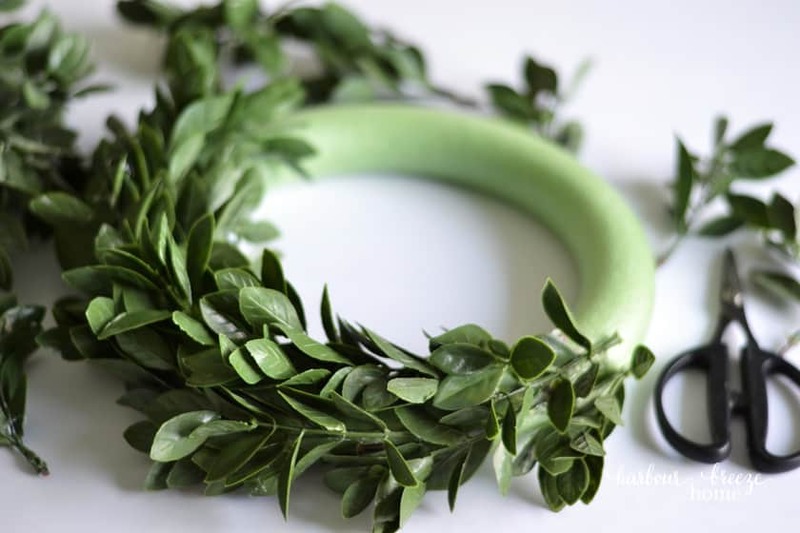 I love greenery, and wreaths, and diy projects! Great tutorial Rita. Pinning!